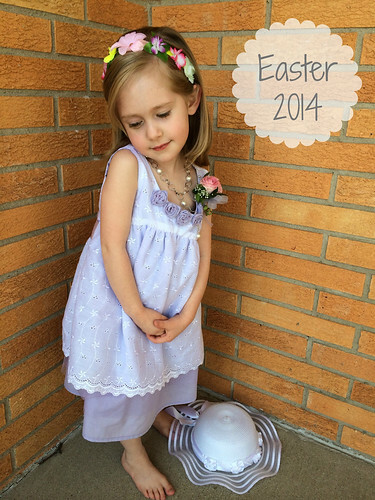 This year I decided it was the year to make Caitlyn’s Easter Dress. If I’m remembering correctly (and who really knows at this point) I haven’t made her a dress for a holiday yet. I tend to make her random dresses when I feel like sewing. 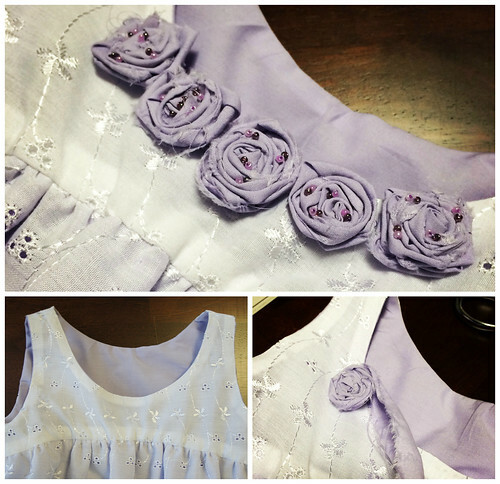 But I had my heart set on an eyelet dress with lavender and figured the only way to get that would be to make it. I really wanted to put a bit of me and a bit of Caitlyn in this dress…so that means some finer details and some pretty fluff. 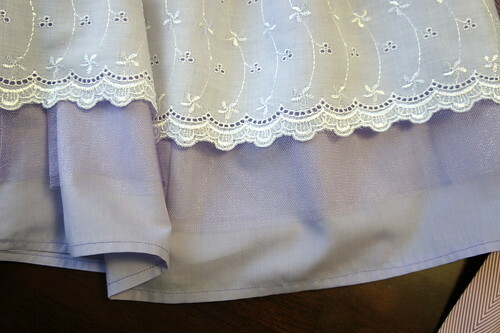 Enter the triple layer skirt: finished edge eyelet, tulle, and broadcloth in lavender. It required some extra measuring, gathering, and such because the pattern was written for a single layer skirt…but it was worth it. I knew the neckline would need something special added to it. 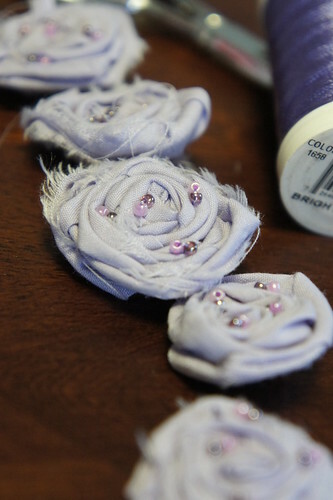 A little something raw that would contrast with the pretty details of the eyelet. I ended up scouring the internet for tutorials on how to make raw edge flowers and had a tough time finding anything that didn’t use hot glue. So I just ended up sort of winging it with a needle and thread, some torn strips of fabric and finally a few seed beads. I loved the result. I had Caitlyn try on the dress for sizing before I added the flowers at the neckline. 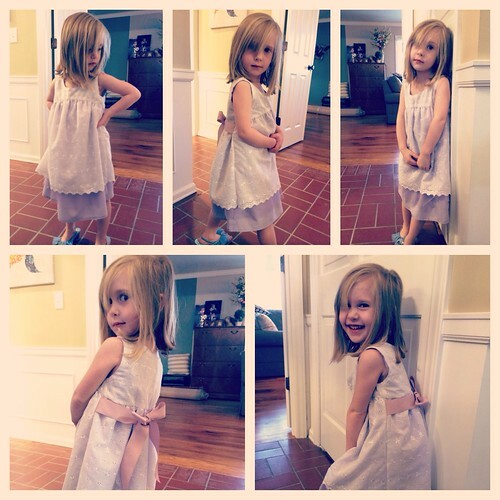 And my little America’s Next Top Model pulled out dozens of different poses for me. I was cracking up…enjoy this selection of her goofiness and numerous views of the dress and the pretty ribbon tie I added to the back. Spring has been slow to arrive around here in Northern Indiana. 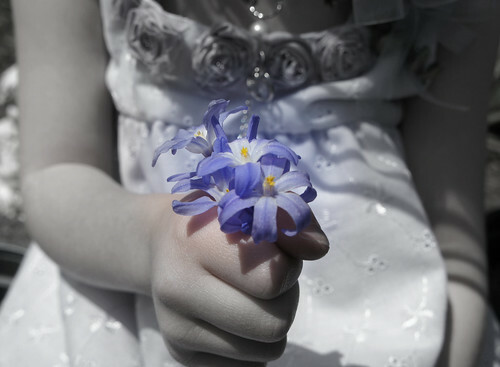 I was happy to see the flowers start to bloom and a couple were snatched up by little hands. 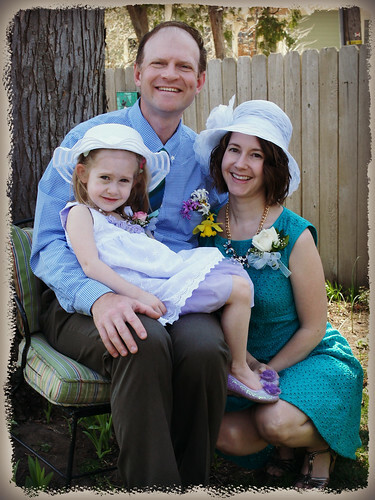 A very Happy Easter Season from my little family to yours! What a lovely dress! Your daughter looks wonderful! Your daughter's dress is a perfect match for her personality and your style. I love eyelets and was just thinking last night that I'd like a skirt myself. I love that you are wearing flowers—I am not sure when that stopped happening here—but it is a lovely Easter touch. My dad always bought my mom and I a corsage for Easter and part of my husband's new role when we got married was to continue that tradition. I'm also determined to bring Easter Hats back into fashion. lol No one else wears those either! Such a beautiful dress! Pretty eyelet fabric and flowers. 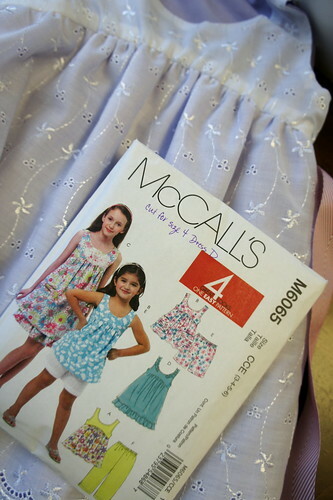 I have dresses that my mum made for me for the girls to wear but need to make some myself! Very cute! I remember my grandmother making me Easter dresses every year when I was little. LOVE those modeling shots. Oh my! Her dress turned out beautiful. Congratulations. I can't believe how big Caitlyn is getting! Such a beautiful family!! gorgeous dress! I made my girls dresses too but nothing like this 😉 A nice trip to the mall made me want to sew a bunch of clothes, it's getting SO expensive.